You’ve tightened your faucets to make sure there’s no drip, drip, drip throughout the day. You’ve used a handy home audit checklist to make sure you’ve identified any opportunity for improvement. You may have even upgraded your appliances to water efficient versions. But what about the tanks, wells, and miles and miles of pipes that water travels through before it gets to you? What does San Jose Water do to prevent leaks and water loss on its end? The U.S. Environmental Protection Agency reported that the average water loss rate for water utilities across the United States was between 16-20% in 2015. In comparison, SJW has an average annual water loss rate of approximately 7 percent. We’re an industry leader in water efficiency and loss prevention and we’re constantly looking to improve. If you’ve ever driven past a leak, or noticed one in your own neighborhood, this might not seem like the conventional wisdom. Not to worry, once you report that leak, or we spot it ourselves, we are on it. But we aren’t just repairing the leaks you report to us, we’re using the latest tech to find them before they’re even visible. SJW uses two cutting-edge technologies to identify where leaks are occurring. 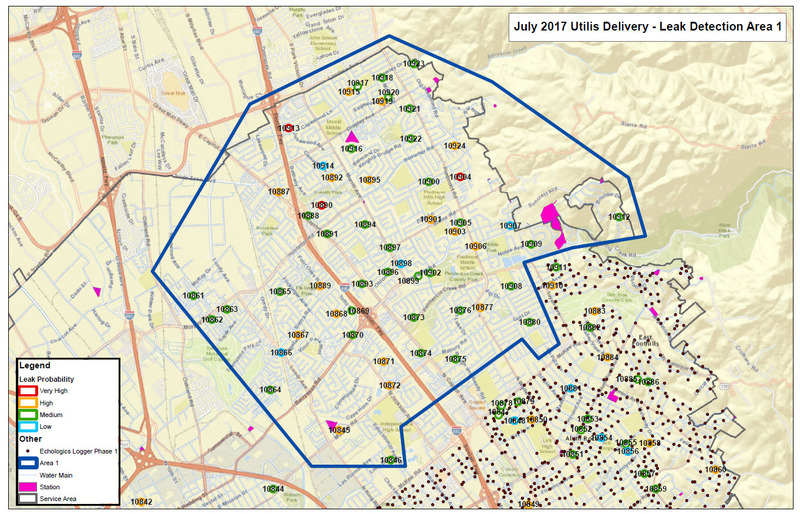 Acoustic leak detection sensors – Mobile acoustic sensors are being deployed throughout the service area and provide San Jose Water with an opportunity to identify and repair leaks while they are still small and before they reach the surface. Every night these sensors listen for acoustic anomalies. When anomalies are identified, an automated procedure correlates and maps the location of each suspected leak. Field staff then use this information to investigate and quickly make repairs. Every year SJW performs a water loss audit for a data-driven approach to leak prevention. The system-wide water loss audit helps the team identify opportunities for continuous improvement. That audit and statistical modeling determines which sections of pipes are replaced based on which section of pipes have the greater number of leaks and which has the greatest probability of damage or failure. Every year, SJW replaces 1% of the buried infrastructure, which translates into 24 miles of pipe replaced each year! Using this combination of cutting-edge technology and planning, SJW is able to reduce water loss each year in our community. As soon as we become aware that there is a leak in our system, we send an inspector out to assess the severity of the situation. Leaks are ranked on a numerical scale with those that require immediate attention being given top priority. The most severe leaks are determined to represent a serious hazard or a danger to public health or property. If a leak doesn’t require an immediate response, it is placed on our maintenance repair schedule and a crew is sent out to address it over the course of the next 48 – 72 hours. Most leaks are addressed within a week of being identified, when you consider the 2,400 miles of pipe we maintain every day that’s quite a feat! Our pipes could be stretched from the Oregon border to the Mexican border and back three times! One of the reasons it may take a few days to address a leak is that before we can dig we contact a utility location service to ensure we’re not disturbing power, cable, or telephone lines before we begin excavation. You can do this before you dig by calling 811. After nearby utilities have been marked we send out a crew to make the repair. It’s an involved process that requires the commitment of significant resources, which is why we make every effort to keep our infrastructure in a good state of repair to avoid water loss. Like you, we believe water is a precious resource and we take its conservation seriously.